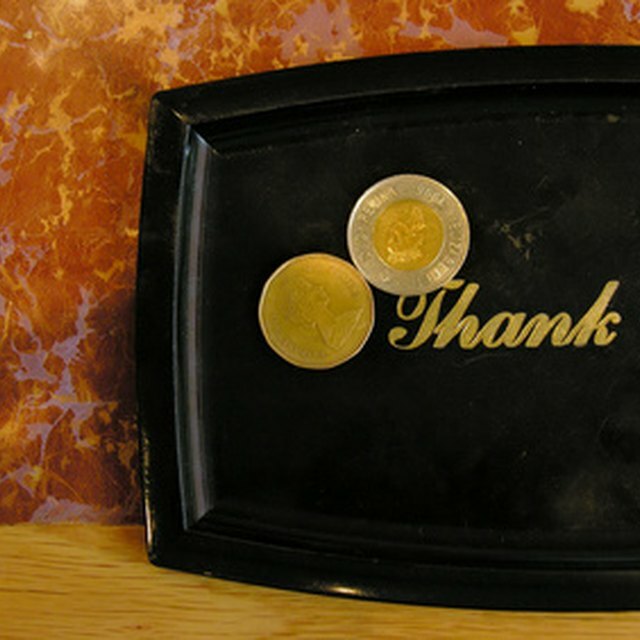 Paying a gratuity when you go to a restaurant to eat is proper etiquette. Depending on your region, 15 to 20 percent is customary. Restaurants can't typically add a gratuity to your credit card without your permission, but they can charge you a gratuity as part of your bill in many cases. Restaurants do have the right to add a mandatory fee, however, this is not technically considered a tip by the IRS. Instead, it is to be reported as a service fee and is subject to payroll tax withholding. In general, you shouldn't dine at a restaurant if you aren't prepared to pay a tip to your server. Typically, if you receive good-to-excellent service, you add around 20 percent on top of your bill, according to the TripAdvisor tipping etiquette guide. TripAdvisor also notes that you might tip up to 25 percent for exceptional service, or for certain high-quality restaurants in New York City. If you thought it was more mediocre, you could lower your tip to 15 percent. If you go to a restaurant alone or with one or two people, you usually add the tip to the bill yourself. On a $30 bill, for instance, you would add $6 for a 20 percent tip. Many restaurants have policies of automatically charging a certain percentage for a gratuity, often 18 percent, if you have a group of eight or more. To legally do so, the restaurant must communicate this policy ahead of time through signage or on menus. If your food is $100 for the table, your bill would likely arrive with $18 added on for the gratuity. You see this add-on and the total before paying the bill. While the restaurant can add 18 percent to your bill, it typically can't charge more to your credit card than what was communicated to you up front. In most cases, you get a receipt indicating the total, including any added gratuity, and you select a payment method. The restaurant can't give you a receipt showing a $20 total meal cost and then add 18 percent on when the purchase is processed. When a tip isn't automatically added to your bill, you should pay it separately with cash to ensure it goes directly to the server. Does a Creditor Have to Notify You Before They Charge Your Credit Card? The IRS tax Revenue Ruling 2012-18 has significant implications for automatic gratuities. The rule requires restaurants to treat added gratuities as service charges, which means they have to account for them just as they do a server's wages. Under the ruling, a payment is a tip if it is "free from compulsion" by the diner, and the customer determines the amount paid. If the amount is considered a service charge, the company must withhold taxes and the employee likely won't get the tips until payday. Many restaurants have indicated that they will likely eliminate automatic gratuities because of the rule. Bellville News-Democrat: Answer Man: Is it Legal for Restaurants to Include Mandatory Tip?